Attachmate Replacement? Try ZOC Terminal, a modern and rock-solid alternative to Reflection and Extra! Do You Need an Attachmate Replacement? ZOC can serve as an attractive alternative to Attachmate. It offers similar features at a much lower price, because our pricing model is a one time payment, including support and updates without yearly maintenance fees. Don't just take our word on it. Ask what our competitor recommends. Is the vendor committed to terminal emulation? We sure are. While we offer a few other products, ZOC Terminal is our main product, bringing over 90% of our sales. So, yes we are committed to bring you the best terminal emulation experience possible, because this is the essence of what we do. Does the vendor have a history of technological innovation? We sure have. 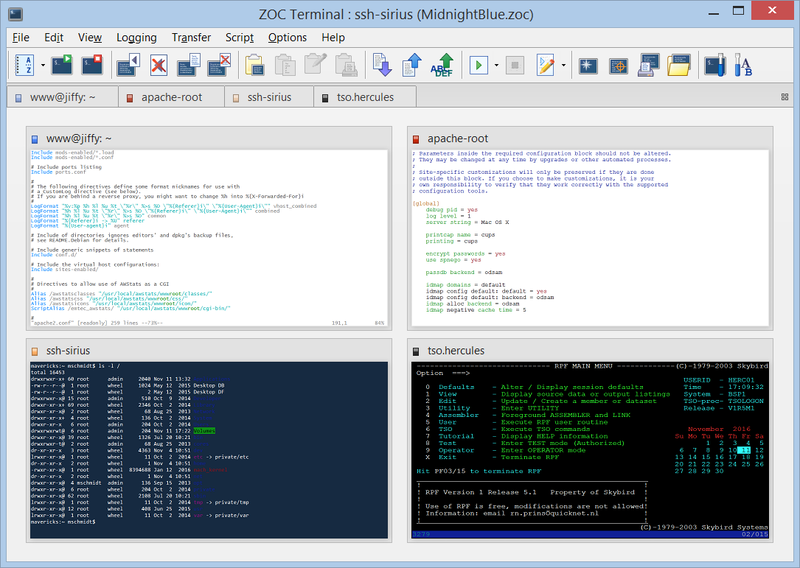 ZOC dates back in the 90's when a terminal emulator was a window and not much else, we introduced a few features to the market that were quickly adopted by our competitors. Even today ZOC offers some unique features that few other terminals have. Does the vendor have experience and staying power? We are in the business of terminal emulation since 1987. Is that long enough? Can the vendor meet your technical support needs? Every support question you have, will be answered by a programmer that has access to the source code and who has the autority to make a new build available (e.g. a version with a bug fix) or to introduce a new feature. Will the vendor help you navigate the standardization process? Ok, we admit it. We fail here. We don't have a four-phase migration guide and checklist. But you get the same support pre-sales that any licensed user will get. By a skilled programmer (see 4.). If we are a competent and trustworthy vendor of terminal emulation, even by our competitor's standards, why would you pay more per on yearly maintenance of their product than what you pay for a full and ongoing license of ours? 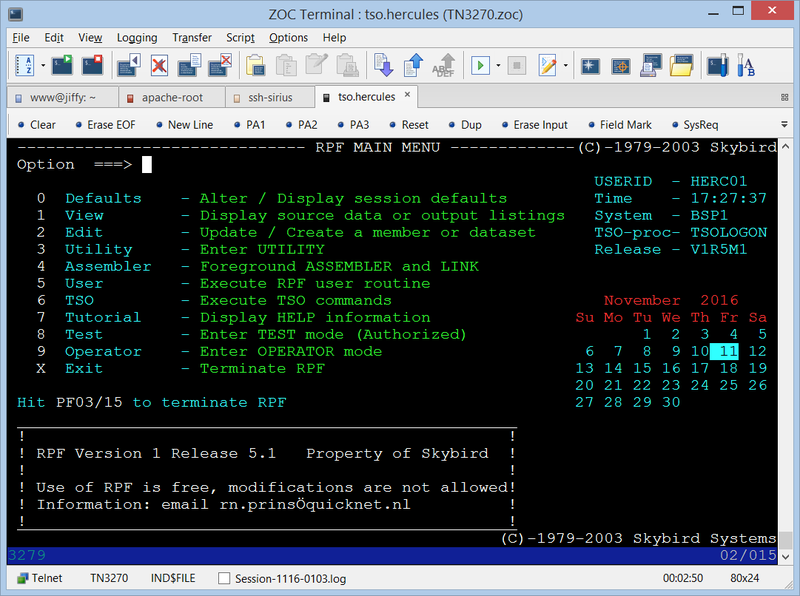 Download ZOC Terminal V7.23.3 now. Attachmate®, founded in 1982 by Frank W. Pritt and Julia Pritt focused initially on the IBM® terminal emulation market, and became a major technology employer in the Seattle area. In that time, the company became one of the largest PC software companies in the country, and made several acquisitions, through mergers and purchases, to expand its range of host access hardware and software solutions. Attachmate focused on 3270 emulation for PCs with custom hardware 3270 boards to replace the original physical 3270 terminals made by IBM. After the acquisition of DCA, the company quickly dominated the 5250 and VT marketplace as well. Attachmate's product Attachmate Reflection® Desktop was used by many of the fortune 500 companies and is well known for its high purchasing price and high yearly maintenance cost. After severy further mergers, Attachmate was acquired by MicroFocus® (mostly known for its Rumba® product) and Attachmate's products Reflection ®and are now part of the MicroFocus product line (Reflections becoming the Extra!® product). Note: Attachmate,® Microfocus,® Reflections,® Rumba® and Extra!® are trademarks of MicroFocus Inc.
ZOC Terminal was created as a 32-bit software under OS/2 in 1995, which was about the time of the height of Attachmate's fame. Over the years, ZOC has undergone many transitions. Offering a Windows implementation in 1999 was a step towards more propularity, when the first cracks (crashes) began to show in Attachmate, for example when trying to run it under (then) newer operating systems like Windows 2000. Then offering a macOS version of ZOC in 2010 was another major step for ZOC. Unlike Attachmate's neglect after being taken over by MicroFocus and living a live on the back burner of a large software company, ZOC Terminal has been and is under continued development over the last 20 years, still being in the hands of its original developers and known if its competitive bulk pricing. ZOC shares many features with Attachmate, e.g. superb TN3270, VT220, and Wy-50 emulations, as well as an extensive scripting language, modem and telnet access to hosts. But ZOC also offers modern features like tabbed sessions, a refined graphical user interface, secure shell connectivity and full support for modern operating systems like Windows 10 and macOS High Sierra. In other words, if you are feeling the pain of continuously paying for an Attachmate based solution today, ZOC Terminal will offer an excellent alternative.